Moving house is a very stressful experience – here at TH Removals we’re here to help with the tough task of getting your belongings from A to B with minimal fuss. We serve clients based in and around Hemel Hempstead, Berkhamsted and Tring – so if you’re moving in and out of any of these areas please do get in touch to see how our quote stacks up against other removal companies. Hiring a removals company on price alone isn’t always a clever thing to do. Invariably those that offer the lowest rates are the companies that lower costs aggressively – sometimes this can mean that they’re not properly insured – which is never a good thing. 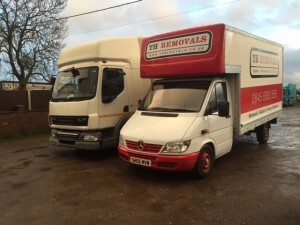 Here at TH Removals we do our best to offer the lowest rates without cutting any corners. From the service that we provide to you, to the fleet that we maintain – no corners are ever cut and everything is done properly. It’s good to know that we cover Buckinghamshire, Bedfordshire and Hertfordshire – so whether you’re moving just a few miles, or even a few hundred miles, the chances are that our friendly team of removals experts will be able to help you. When it comes to moving house, it’s important that you hire a team of workers that are highly experienced in what they do. You’ll be glad to know that here at TH Removals all of our employees have vast experience when it comes to house removals – experience means a whole lot in our industry. We believe in professionalism and punctuality – when we take on a job for a client we won’t rest until that job is complete. We understand that moving house is fraught with hassle and problems – we aim to make the removals aspect of moving home as stress-free as possible – leaving you with one less thing to worry about. You can rely on us when it comes to house removals! We want you to know that we’re here to help. Working with us is easy – we won’t tire you out or make you worry – you can trust us! All you have to do in order to get a quote from us for the cost of our removals service is to call or email us. We’ll get back to you promptly with a competitive, accurate quote for your consideration. Get a quote from TH Removals in Dacorum, we’ve been providing moving services to the people of Hemel Hempstead Berkhamsted & Tring for over 12 years now. Simply fill in our Quote form or see our Pricing guide.